Triple Talaq Bill in Rajya Sabha: The Triple Talaq Bill sailed through the Lok Sabha where the BJP-led NDA government enjoys a brute majority. A total of 245 members had voted in favour of the bill against 11 members who voted against it. Triple Talaq Bill in Rajya Sabha: The Modi government on Wednesday once again failed to table the Triple Talaq Bill on the floor of Rajya Sabha. The protests by AIADMK MPs over Cauvery issue forced the Chair to adjourn the House till 11 am on Thursday. Earlier on Monday, the Triplr Talaq Bill was introduced in the Upper House but couldn’t be taken up for discussion due to a continuous uproar by the opposition parties who are demanding that the bill be sent to the joint select committee of both the Houses. The bill sailed through the Lok Sabha where the BJP-led NDA government enjoys a brute majority. A total of 245 members had voted in favour of the bill against 11 members who voted against it. The opposition parties including Congress, AIADMK, Trinamool Congress, BJD and others had staged a walkout when the division was done in the Lower House. In the Rajya Sabha today, where the government lacks a majority, it is likely that opposition parties will once again disrupt the proceedings. The Rajya Sabha has not transacted any business in the Winter Session due to protests by the opposition parties over a host of issues. Rajya Sabha adjourned till 11.00 am on Thursday after protests by AIADMK MPs on Cauvery issue. The Modi government was slated to table the Triple Talaq Bill on the floor of the House today. The Winter Session will conclude on January 5. 1. The Muslim Women (Protection of Rights on Marriage) Bill, 2018 proposes to make instant triple talaq or talaq-e-biddat a punishable offence with a jail term of up to three years with a fine. 2. The bill has made the offence compoundable. This means the case can be withdrawn if the man and his estranged wife reach a compromise. 3. According to government's claim, no one can misuse the law as only the wife and her close relatives can file an FIR. The fresh bill to replaces an ordinance brought by the government the in September. 4. Another amendment in the bill says that magistrate can decide on releasing the husband on bail only after hearing the wife. 5. A jail term of three years will only be awarded by the magistrate once the trial is over. 6. The triple talaq victim will also have authority to seek the custody of her minor children. The magistrate will take a final call on the grant of custody of minor children. The Rajya Sabha met at 11 am to transact business. But as soon as the House met, AIADMK members started protesting on the floor of the House. The AIADMK has 13 MPs in the Rajya Sabha. The Rajya Sabha has failed to transact any business in the ongoing Winter Session. PDP chief Mehbooba Mufti has accused the BJP of dividing India on religious and sectarian lines. In her remark, Mufti said that the triple talaq bill is the second assault on Muslims after the financial onslaught against them through bans on mutton and leather industries. "When we talk about reservations for Muslims, the BJP rejects it on religious lines. But when it comes to this kind of law, they run to Parliament," she said. The Janata Dal (United) has said that its outside support can;t be taken for granted. The party said that it is opposed to the current form of the bill. Sources told the FE online that party either may abstain or move amendments to the Bill. The JD(U) is against the penal provision. The JD(U) shares power with the BJP in Bihar and has 6 MPs in Rajya Sabha. Triple Talaq Bill in Rajya Sabha: Why opposition wants select committee to oversee bill? The Modi government is likely to make another attempt to get the triple talaq bill passed in Rajya Sabha on Wednesday. However, opposition parties are demanding that the bill be referred to the select committee for further deliberations. At a meeting chaired by Leader of Opposition in Rajya Sabha Ghulam Nabi Azad on Monday in his Parliament chamber, a total of 12 opposition parties leaders' said that the bill needs to be sent to the select committee. Those who attended meeting include Samajwadi Party's Ram Gopal Yadav, TMC's Derek O'Brien, CPI's D Raja and Kerala Congress' Jose K Mani. The opposition parties say that they against criminalisation of triple talaq and forcibly imposing bill is a danger for secularism and national integrity. Women's wing of the All India Muslim Personal Law Board (AIMPLB) on Tuesday appealed to Rajya Sabha members to press for referring it to a select committee for scrutiny. The outfit termed the triple talaq bill inhuman, anti-women and barbaric. "If passed, the triple talaq legislation will damage the family and social fabric of the community," Asma Zohra, the chief organiser of the women's wing of AIMPLB, said. She said that there was no need for this bill after Supreme Court judgment invalidating triple talaq. "It is brought with political and communal motives to divide the society," Zohra said. PDP chief and former Jammu and Kashmir CM has opposed the Triple Talaq Bill saying it will create more problems for Muslim women as it will disturb the family structure among Muslims. Mufti said, "Being a Muslim woman who has gone through a broken marriage, I thought I should speak up on the Triple Talaq bill. After separation from her husband, the biggest problem for the woman is to raise her children." The former CM said that by bringing in the Triple Talaq bill, the BJP is entering our homes. "This will disturb our family life and there will be more problems for women and men economically. I have gone through a broken marriage and I feel that women face the biggest challenge economically after her marriage fails," she said. The Janata Dal (United) of Nitish Kumar may abstain from Rajya Sabha, sources told The Financial Express. The JD(U) is an ally of the BJP and shares power in Bihar. The party has six member in the Rajya Sabha. If JD(U) decides to abstain from the Upper House, it will only give a boost to the opposition's strategy. The Rajya Sabha was adjourned till 2 pm after opposition members rushed to well of the House and created uproar over a host of issues. Chairman Venkaiah Naidu adjourned urged the protesting MPs to go back and later adjourned the House till 2 pm. Rajya Sabha Chairman M Venkaiah Naidu told MPs that the image of the Parliament is taking a beating. "People are laughing at us. Please cooperate to see that this House functions in a meaningful manner for the remaining days and pass some resolutions. Issues cannot be dictated." Oppostion parties have been demanding from the Modo government to refer the Triple Talaq Bill to the joint select committee of both the Houses for a study. They say that they are opposed to bill in its current form. All parties have united against the government's move and prepared a strategy to stall the legislation in the Rajya Sabha. In the Lok Sabha, opposition parties including many regional players had staged a walkout at the time of division. 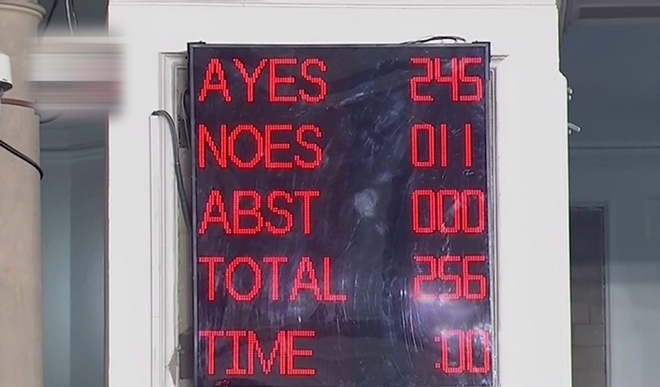 A total of 245 MPs had in votes in favour of the Bill in the Lok Sabha on December 27. Tamil Nadu's AIADMK did not support the bill in the Lok Sabha. Other important regional players BJD, TRS, SP, TMC, BSP, TJD, DMK, NCP, AAP, CPI(M), CPI KC(M) have also expressed reservation of the bill in its current form. New Delhi: A burqa-clad Muslim woman in the walled city area of New Delhi, Thursday, Dec. 27, 2018. PTI PhotoThe Supreme Court had in August 2017 declared instant triple talaq unconstitutional. The court held that the practice violates the fundamental right under Article 14 (equality before law) of the Constitution of India. It had also asked the government to enact a law to end the practice. The Triple Talaq Bill was cleared by the Lok Sabha in December last year but it couldn't sail through the Rajya Sabha because the BJP-led NDA government lacks a majority.